Even though it’s still summer and super hot here in North Florida, I’m dreaming of cooler Fall weather and everything apple, especially gluten-free apple bundt cake. My husband loves bundt cakes. Gluten-free bundt cakes are super easy to whip up and are always a crowd pleaser. 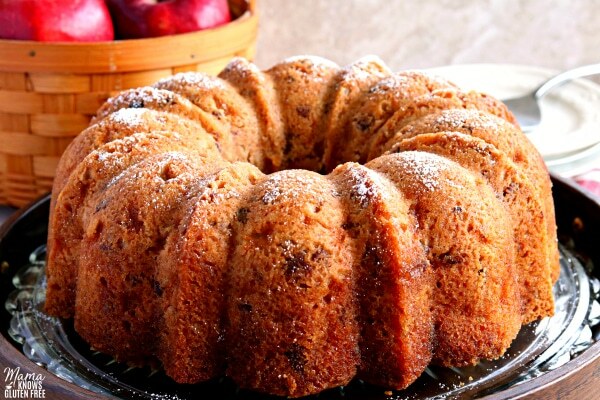 One of his favorites flavors of gluten-free bundt cake is Apple Dapple Cake. 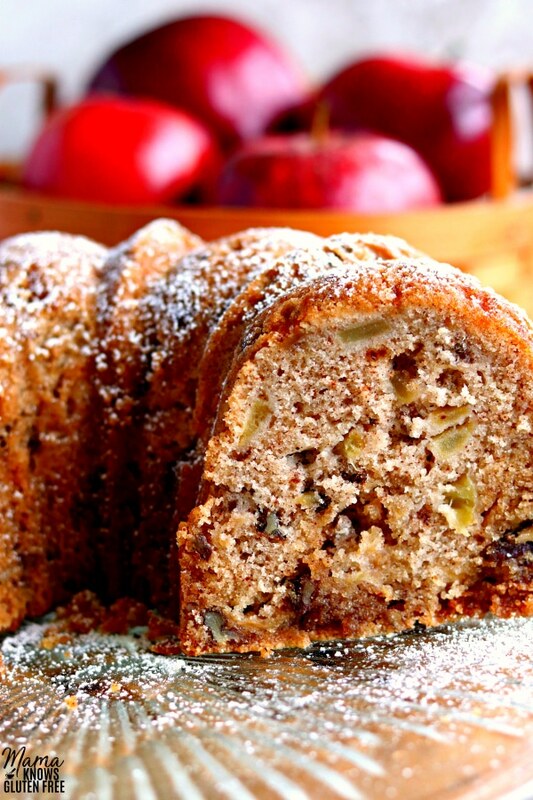 Apple Dapple cake is a super moist apple cake with crunchy pecans and a brown sugar glaze. I really like using gala apples in baking because they are sweet and crisp, but you can use your favorite type of apples. It took four gala apples to make three cups of diced apples to use in the apple bundt cake recipe. The gluten-free bundt cake batter is super easy to whip up. I start by creaming the sugar and butter together in my mixer. Once it’s nice and fluffy I add one egg at a time. I then add the rest of the wet ingredients to the butter and sugar mixture. Once all of the wet ingredients are combined I add the dry ingredients to the bundt cake batter. The batter will start to thicken up. Make sure to mix it until it’s nice an smooth. To finish the bundt cake batter I fold in the chopped apples and chopped pecans with a spatula. I buy chopped pecans, but I always chop them up into a little smaller pieces because I don’t like big pieces of nuts in my cake. Make sure you spray your bundt pan really well with gluten-free cooking spray. I use coconut oil cooking spray and I spray it on really thick. I bake my gluten-free bundt cakes in a Nordic Ware Bundt Pan. Don’t worry if the top of your apple bundt cake has a few cracks in it, because this is the bottom of your cake and no one will see it. Right before it’s time for the bundt cake to come out of the oven, make your brown sugar butter sauce. I have also included a dairy-free option to my gluten-free Apple Dapple Bundt Cake recipe. My husband, my youngest son, and I are all dairy-free. Look at that big ole beautiful slice of gluten-free Apple Dapple Bundt Cake! It’s super moist chocked full fresh sweet apples, crunchy pecans, perfectly spiced with cinnamon and covered in a buttery brown sugar glaze. A gluten-free apple cake does not get much better than that my friends! Looking for more great gluten-free apple recipes? Try these! 3/4 teaspoon xanthan gum , leave out if your flour already has it in it. Add the rest of the dry and wet cake ingredients to your bowl and mix until fully combined. The batter will be very thick. Peel and chop the apples into small pieces. 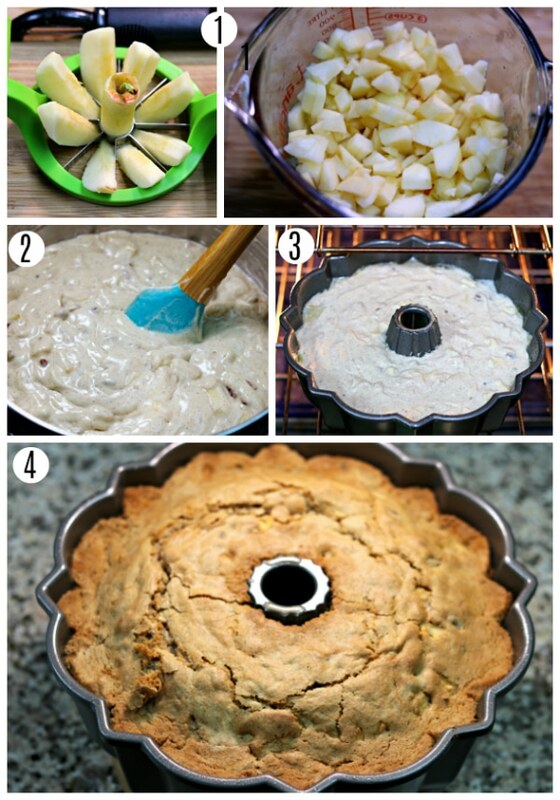 Stir in the chopped apples and chopped pecans and fold into the cake batter with a spoon or spatula. Pour the batter into the greased bundt pan and bake for 70 minutes until a toothpick entered into the center comes out clean. Combine all ingredients in a small saucepan over medium-low heat. Stir continuously until the butter is melted and the sugar is dissolved. Do not bring to a boil. Poke holes all over the warm cake with a knife and pour the butter glaze evenly over the cake while still in the pan. 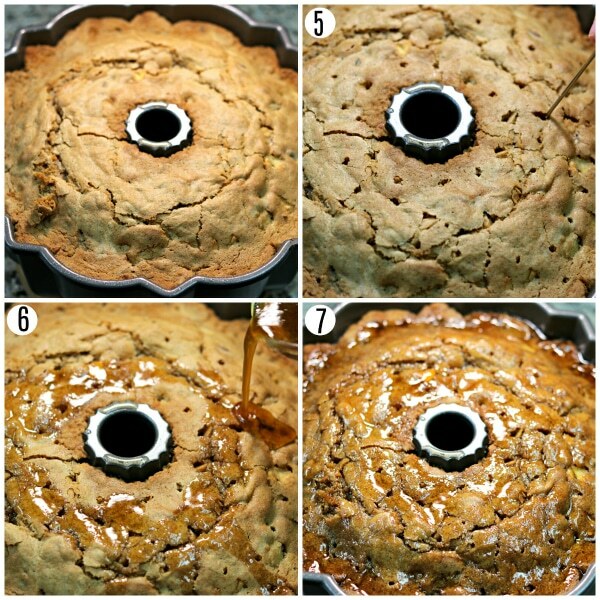 Allow the cake to cool completely in the pan and then invert the cake onto a serving plate. I sprinkled it with powdered sugar. Recipe Notes Mama says "Make sure you check all your labels!" Mhh, this bundt cake looks so delicious and tasty! Apples and pecans go so well together after all, such a automnal feeling! Thank you so much Camille! I love the flavor of apples and pecans together. What type of gluten free flour do you use? I’m finding that the difference between brands is so confusing and makes so much of a difference. Hi Ashley! I use Pillsbury gluten-free flour which is a “cup for cup” all-purpose gluten-free flour that already has the xanthan gum in it. I buy it from Walmart for less than $5 for a 2lb bag. I order it in bulk online. I added it to the recipe ingredients. 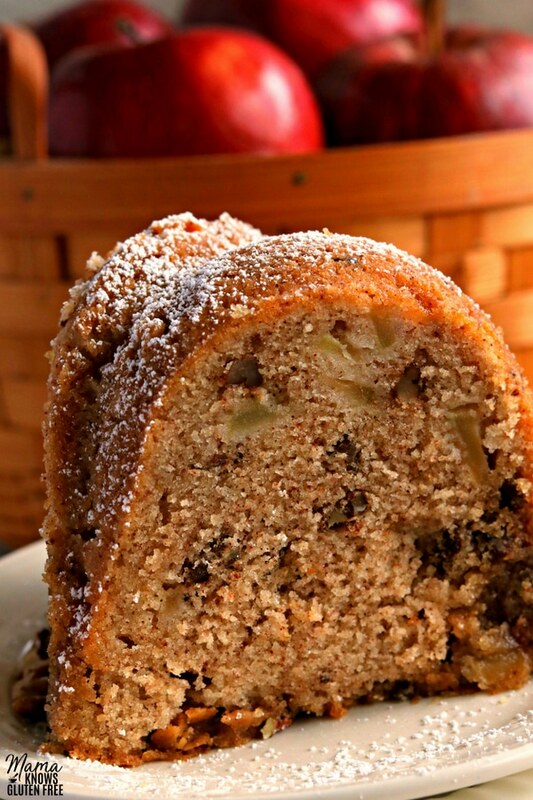 I hope you try it and enjoy the apple bundt cake! Hi Polly! Your pan sounds a lot like an angel food cake pan. I’ve never used a bundt pan that has a removable base before. The pan that I use is a Nordic Ware 12 cup bundt cake pan. You have great measuring skills. 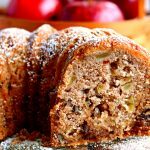 I hope you try the apple bundt cake and enjoy it! This looks and sounds beyond wonderful! Any thoughts on substituting granulated or powder sweetener like stevia for the sugar and brown sugar? Just to lower the calories a tad 😋. Thanks! Hi Connie! I have not tried using Stevia in this recipe. I know a lot of people bake with Stevia. Please let me know if you try it. Has anyone tried this with almond flour before? I was trying to make something that had more protein per serving. I used 2 1/4 cups of GF flour (Pamela’s), and 3/4 cups of almond flour. I also lowered the oil to 1/2 c Earth Balance margarine plus 1/8 cup canola oil. The cake turned out delicious! Thank you Joy for sharing how you used almond flour in the recipe. I am glad that the cake turned out delicious! Just made this for my family for Sunday dessert! It was delicious!! Only one problem I had was getting the cake out of the pan. Next time I make it I will drizzle the caramel sauce on top of the cake! And there will for sure be a next time!! Hi DeAnn. Thank you so much for the wonderful 5-star recipe review! I am so happy to hear that you and your family enjoyed the apple cake. To help the cake from sticking I triple coat the pan with coconut oil cooking spray. The cake drizzled with caramel sauce sounds amazing! Thank you again DeAnn for your kind words, you really made my night and blessed me. Have you tried using maple syrup instead of so much sugar? Do you think that would work in this recipe? Hi Cynthia! I have not tried the recipe with maple syrup. This is a really moist cake and I am not sure if the maple syrup would make it too moist. I have baked with maple syrup, and really like the results it gives. If you try it with this recipe will you please let me know how it turns out?